The Aiwa's have been refurbised with new belts that became very hard to find, we like the Aiwa's for their fast action transport. we have the Aiwa's in several of our studios. A must have for any studio, the JE330 has auto pause after each track is played like a cart machine. This featured packed little mixer features: four stereo inputs and two mono mic/line inputs, cue is available via the aux send pot; counter-clockwise is PFL, clockwise is after. ITC Delta cart machines feature outstanding tape handling and sound quality, standard XLR connectors and low power drain. We have nine playback decks and two record decks, plus a few units for spare parts. one spare parts deck has brought life back to four of our decks, "not bad deal for nine bucks!" and we still have more parts. Behind the Yamaha mixer is a portable Fender guitar amp is powered by a 9 volt battery; this little amp is used as a cue speaker. Mic is a Peavey 37, we like the mic for its big bottom sound. Off camera, is a 2 band BEHRINGER Ultramizer Pro DSP-1424P The DSP-1424P has become a staple around all of our studios. We can feed two separate transmitters with this set up above which consist of the following equipment. The Aiwa's have all been refurbished with new belts. This set up uses the left channel speaker for cueing . We wish we could find another Fender amp! 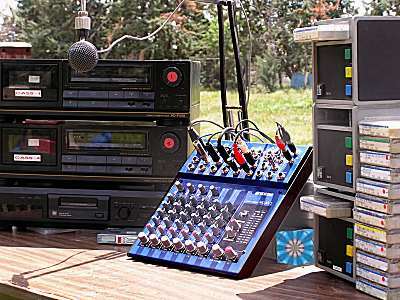 This working set up was built for a movie about an underground radio station, We use it when two remotes are required. Outlaw Radio is a part 15 FM station in Ridgecrest, California. 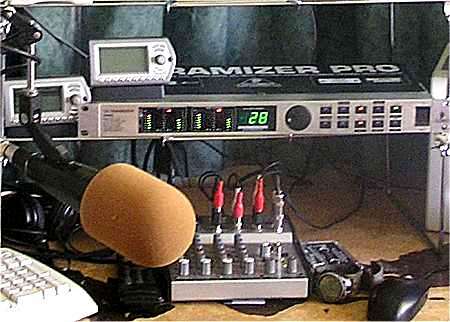 the studio is a simple set up located in a hotel room on the second floor, a 1/4wave ground plane antenna is mounted in the center of the room on a high beam. this location provides good line of sight coverage for about a half mile. The computer on the left is a 700mhz with XP Pro(we found this computer siting outside a dump gate in Keene, CA.) it has Winamp with SQRsoft Crossfading and Sonicart. the computer on the right is a 350mhz running Win98SE with Sonicart. XM radios are used for overnight programming, and hourly news. These XM Radios are older Audiovox's before the FCC had their modulator power output cut way back, both units cover a good city block with ease. 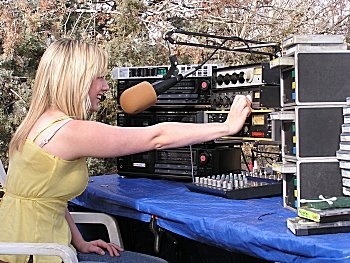 Outlaw Radio is equipped with a UPS capable of keeping the station on the air for three hours during the areas many long power outages, a seperate 400 watt inverter is used to extend the period to 24 hours. Often Outlaw Radio is the only station on the air! 1. 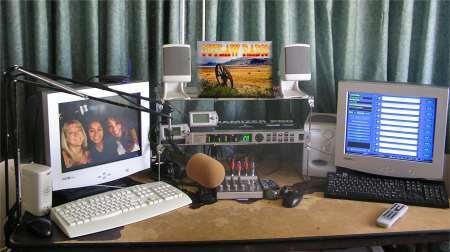 The computers are not used during outages, instead XM radios are used along with a weather radio. EDM 10-100mw transmitter outside it's case, Outlaw Radio uses two in a main - stand by configuration, only one drawback to these transmitters we have found so far; is that the RF connector can break if to much pressure is applied. "Be Very Careful" otherwise these are the best transmitters in their class. Our EDM's are configered for 100 milliwatt output.